What's the measurable effect of creating more video content for an athlete? Here's a quick look at the stats from my own experience shooting 16 daily vlogs for Red Bull athlete Paul Guschlbauer while he took part in the 'World's Toughest Adventure Race', the Red Bull X-Alps. Viewed in a total of 163 different countries, the top 5 being Germany, Austria, Switzerland, USA and Italy. You can read all about how I went about creating the vlogs here, but to explain how we went about publishing the posts: once I'd finished editing, I'd upload the vlog directly to Paul's YouTube channel and then share it via his Facebook and Instagram. I created a short 30 second teaser for each vlog for two reasons; first it meant we could upload a video directly to Facebook rather than embed the YouTube link and risk having the post hidden by an algorithm; it was more interesting to post a short video than a photo on Instagram, which has a limit of 60 seconds for posts and 10 seconds for stories. The main video link would then be in the description on Facebook and in the bio on Insta. I aimed to publish them at 10am each morning for consistency but sometimes this was impossible due to slow internet speeds. 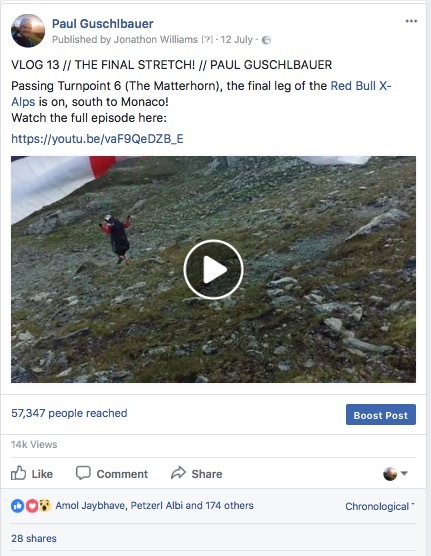 As far as I'm aware, the main Red Bull X-Alps website had an 'Athlete's Feed' that automatically displayed the vlogs too and there was a dedicated page on Redbull.com, also showing them. Undoubtedly the vlogs increased Paul's (and the race's) exposure with this kind of audience reach. We received many comments from the fans saying that the videos gave them a great insight into exactly what an athlete was going through on a daily basis, something that the general highlight videos created by Red Bull just weren't doing. Although we kept the videos authentic with no sponsor logos or any paid product placement, the videos still gave daily airtime to Paul's sponsors as he was naturally using their equipment throughout the race. This was a benefit for both parties - the sponsor getting authentic exposure and ideally Paul proving that his brand image is worth sponsoring! Now the race is over, Paul also has an archive of material that can be used to market himself for years to come.